Set into the side of the Tjampuhan valley in Bali's cultural heartland of Ubud, the Pita Maha Resort and Spa is a landscaped jewel overlooking the beautiful River Oos. 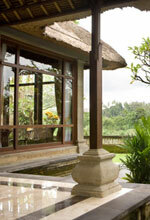 From the lobby and restaurant are, the natural beauty the Ubud foothills is immediately apparent. Sweeping views of lush rice terraces and tropical woodland draw the valley to the sea, where the airport is just 45 minutes by road from this mountain retreat. On your arrival, our professional and friendly Balinese staff will greet you with a traditional welcome drink, the Brem Barong, in our splended and spacious Lobby Lounge. It has a sensational view across thevalley to the distant and verdant rice-field. Pita Maha Grand Swimming Pool & Bar. 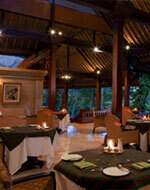 Terrace Restaurant & Bar serving Breakfast, Lunch (Balinese and Western cuisine), Dinner & Supper (International Cuisine). Cassette and CD - Available from Guest Service Centre. Book Library - Available from Guest Service Centre. Personal Safe Deposit Box in every Villa. A striking innovation in Balinese accommodation, in addition to the luxurious settings, is the presence of a unique and intimate "plunge" outdoor garden pool in ten of the Villas, designed for the frequent cool immersion that enhances the golden suntan for which Bali is famous. The ambience created of Bali from earlier days is a striking achievement of the architect, who is a member of the Royal Family of the Ubud Palace. The standard of workmanship, in carving, thatching, wood carving and stone befits that of only the most ancient and powerful Balnese Palaces. It also has elegance, modern conveniences and luxury expected by the international travellers. Immerse yourself and relax in style with a healing session at the Pita Maha Private Villa Spa. The centrepiece of the resort, the lavish-appointed Private Villa Spa offers a new completeness in health treatments, the total relaxation of body and mind in the most exquisite surroundings. Tucked away in the most secluded corner of the Pita Maha Resort and Spa, this luxury villa has every facility for the ultimate spa break in total privacy. Sauna and steam room open onto hot or cold whirlpool baths, an eight- metre private pool, and a spring water plunge pool overflowing with fragrant tropical flowers. An enchanting split-level design offers massage, aromatherapy and herbal treatments in a private relaxation room between spa and villa while out door dinning and leisure pavilions complete the perfect healing hideaway. Open daily from 09.00 am to 09.00 pm, the Private Villa Spa is available for two-hour season for couples or small groups of t four persons.